Compatible with fertilizer, seeds, and more with simple gate adjustments. 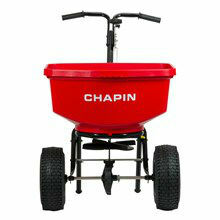 100-Pound capacity hopper with rugged powder coated steel frame. Cast Zinc-plated agitator & metal gears are enclosed to prevent debris interference. Solid steel gate linkage and adjustable rotary gate for spreading a broad range of product. Unique spread pattern control allows for precise control of spread pattern. Wide tread 12-inch pneumatic tires for stability. Includes rain cover and hopper grate. Finger grip on hopper for balanced lifting.